MODERN WOOD COFFEE TABLES WITH STORAGE. BED SIDE TABLES, END TABLES & ACCENT TABLES. HANDMADE CUSTOM WOOD FURNITURE. Small narrow table with inset shelf. Solid wood accent table, small occasional table or tall narrow end table for small spaces. An 8 inch narrow entry table with lowered shelf. The contrasting tiger maple shelf adds interest and shows off the hand-cut joinery. Tall entry table, small narrow console table or tall small table for an elegant wood entry table. 5 wood combinations available. Simple and slender with an inset shelf. A tall narrow side table, entry console table, narrow hall table or artistic side table. Need the measuremenrts adjusted? With our custom table option, it's easy to get a perfect table for your space. Solid wood coffee table in a more narrow size for small rooms. Clean modern furniture styling with beautiful handmade details. Solid wood accent table for small spaces. Small hallway table, entry console table, artistic side table- 2 wood combinations available. A tall entry table, narrow hall table or accent table for small spaces. Modern Wood Furniture- 2 wood combinations available. 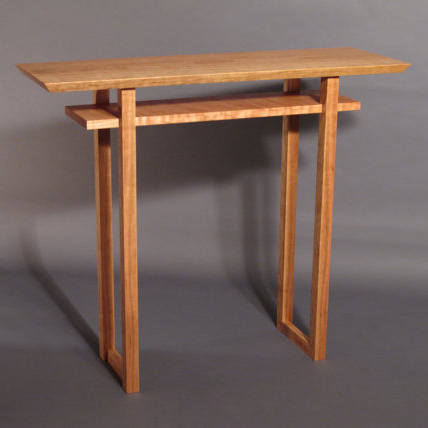 Modern wood table for a narrow side table, entry console table or narrow hall table. Available with a live edge stretcher. 2 wood combinations available. A narrow wood tables for small spaces with a unique live edge table top. Handmade from solid walnut. A small nightstand, end table or accent piece. A tall small table for the entryway or hallway. Japanese furniture styling and minimalist design lines with unique live edge detail and gorgeous solid wood. Inspired by our Classic Collection, these small tables feature a low shelf that is perfect for extra storage, display or a small bookcase. 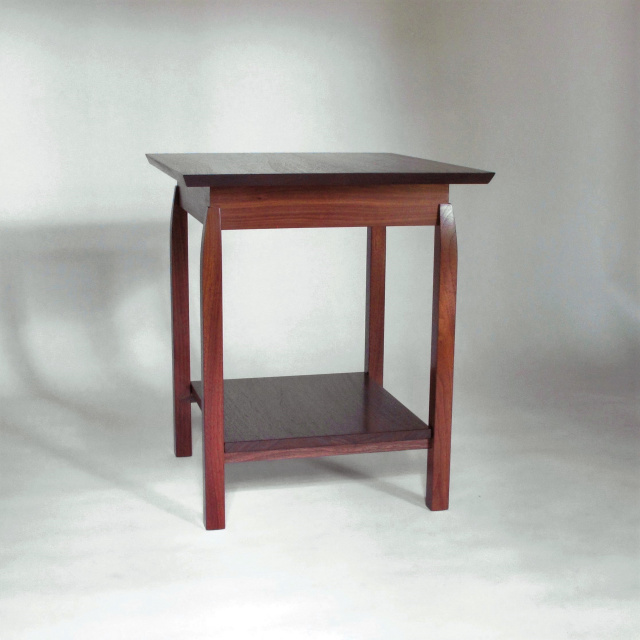 A narrow side table with low shelf for a small entryway table, narrow hall table or artistic wood accent table. A live edge table top adds a touch of nature. Need the measurements adjusted? With our custom table option, it's easy to get a perfect table for your space. 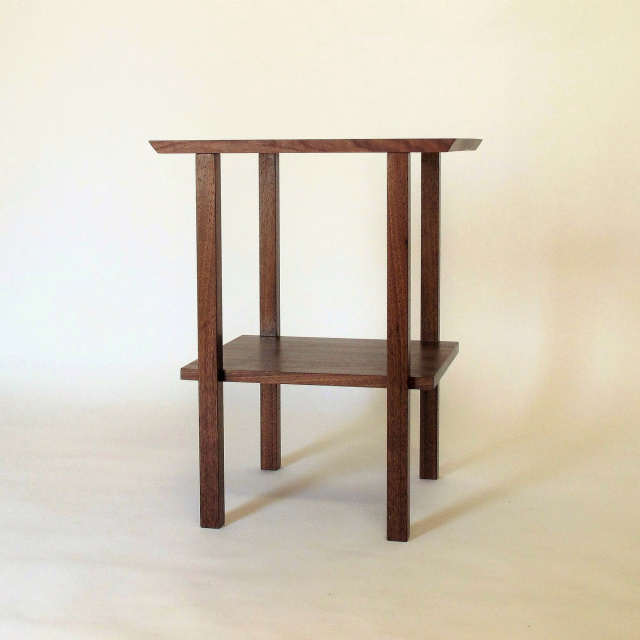 A side table with shelf or large end table to share between a pair of chairs. Transitional, contemporary handmade wood furniture. Signature Visible Joinery. A small bed side table or accent table- Mid Century Modern Zen- 5 wood combinations available. Narrow side table with shelf. Artistic curves, floating panels and dovetail accents. Also available Shaped End Table 18"x9"x24"
Our solid wood coffee tables and modern accent furniture make a statement in your living space. Show off your style and personality with these modern wood side tables, end tables and coffee tables by Mokuzai Furniture. Connecting nature with your interior, our modern wood furniture is useful and beautiful.